Squirrels may also use this box. 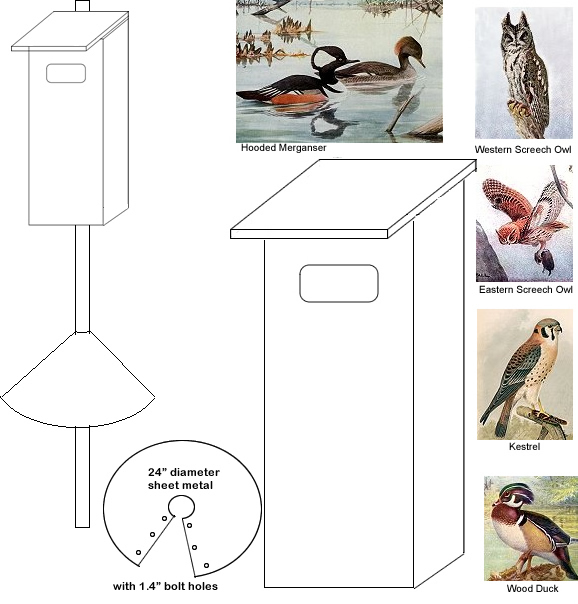 Suitable Nestbox Size: 24-inch by 10.5 -inch by 13-inch. No perches at the entrance holes as they would aid predators. Roof: Hinged, secured with shutter hooks. Sloped down, overlapping on the sides and the front reduces exposure to rain and makes it more difficult for predators to get to the chicks or eggs. Material to be used: Red Cedar (more durable than other wood material), rough cut boards or exterior-grade plywood at least 1/2" thick. Unpainted. Mount about 12 - 20 feet high. Line nest box floor with some wood litter. Take nest box down after each breeding season, and repair and sanitize before reusing.